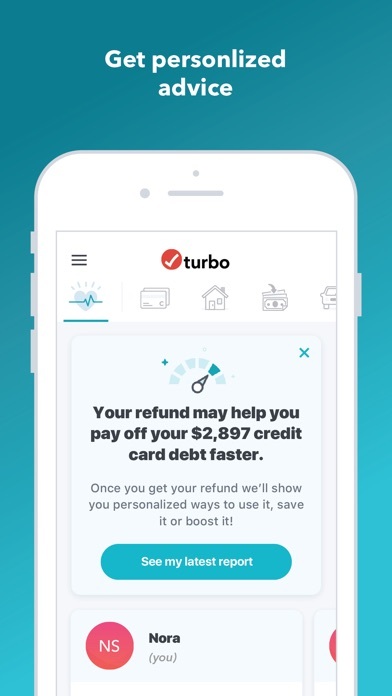 Take charge of your credit and financial health with Turbo, FREE from the makers of TurboTax! Unlock your financial potential with the knowledge and tools you need to make your best financial decisions – powered by your tax and credit data. Turbo Key Features: ● Free Credit Score: Check your credit for free with Turbo. Learn your VantageScore credit score, directly pulled from TransUnion. Turbo gathers the latest data to give you an up-to-date view of your financial health. Checking your credit report won’t affect your scores. ● Free Credit Report: Sign up and get a free credit check with the touch of a button; we’ll provide you with your credit report instantly. Turbo pulls together three important numbers to provide you with further insight into your financial health: verified income, credit score, and debt-to-income ratio. Examine your payment history, credit utilization, types of credit, derogatory marks, and more. ● 24/7 Credit Monitoring: Turbo can help you spot identity theft with 24/7 credit monitoring*. Access your free credit report instantly to determine what’s changed. 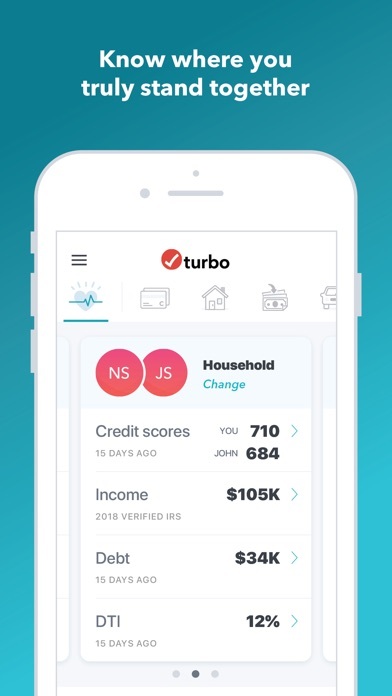 ● View Verified Income and Debt in One Place: Turbo is more than a credit score app. See where you stand with your verified income, debt-to-income ratio, and credit score in a single account dashboard. 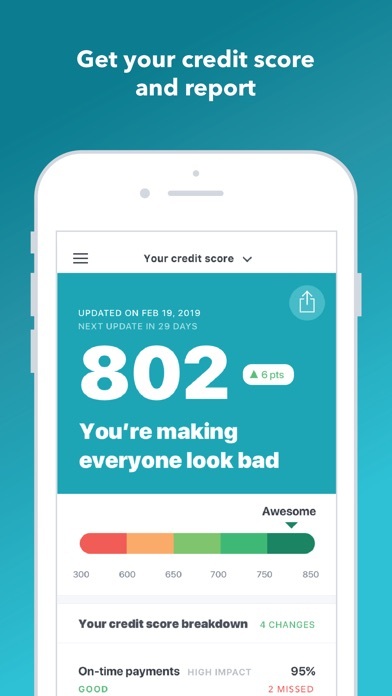 ● Get Personalized Advice: Turbo provides you with personalized advice based on your credit score, verified income, and debt-to-income ratio. Get custom tips to help you improve your credit score, pay off debt sooner, and save money on interest. ● Let Smart Tools Do the Math for You: Get insights to help you reach your financial goals. You can see what you may qualify for today and what you might be able to afford in the future on mortgages, personal loans, and more. ● Totally Free: Turbo is completely free to use. We won’t upsell you or ask for any credit card info. Check your credit score for free, with just the click of a button. ● We value your security: Turbo works hard to safeguard your information by encrypting all of your data stored in our systems. 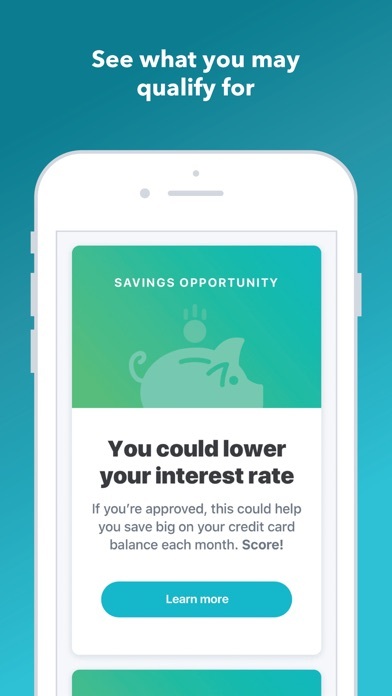 Turbo may be the financial tool you’ve been waiting for. With up-to-date data and expert knowledge, your credit report may be able to provide you important insight into your financial health. Run a free credit check with Turbo and discover your financial potential. *Credit reporting provided by TransUnion. There are various types of credit scores, and lenders use a variety of scores to make lending decisions. The credit score provided by Turbo may not be the specific credit score used by your lender. Pushing high interest credit cards, no way to delete account. I’m a retired government accountant and I struggled with keeping up with the changes once I returned stateside. That was 2007 and I’ve been a Turbo Tax client ever since. I can trust that they waded through all the updates to the tax laws, tested their software, and put out a quality product! Customer service is top notch, too! I’ve needed files retrieved, many prior year software requests, and sometimes advice that was beyond me. Thanks for being wonderful so that I can do my taxes in minutes and submit them early January! You guys rocks!!! Turbo Tax software hoax you to download the wasted time of even bothering to opening and checking your credit score. What an app to consolidate and give you an overall picture of what’s the current state of your financial status. Love it !!! Love the ease of use! Great app for staying on top of our financial picture. Easy interface, and useful features. It keeps asking me for my SSN and whenever I enter it in and try logging in, it will start loading and then bump me back to log in. And yes I know what my SSN is, and I have all the other fields filled in properly too.